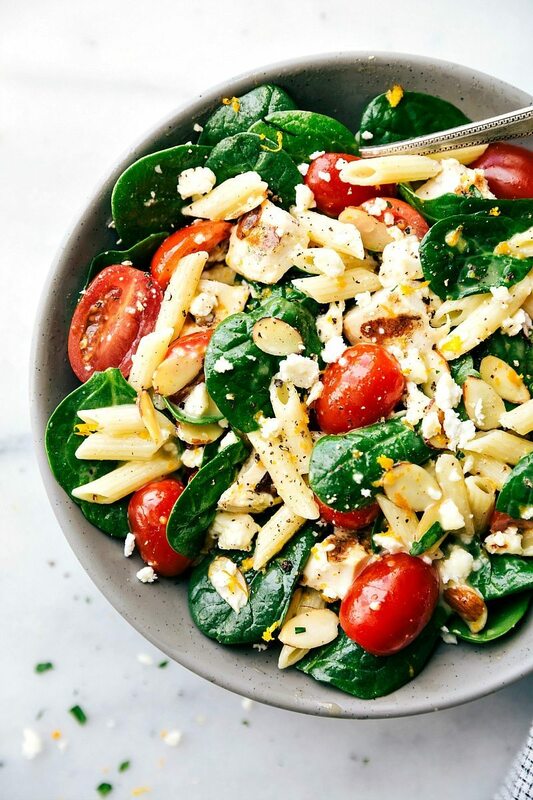 A spinach salad with penne pasta, grilled chicken, cherry tomatoes, toasted slivered almonds, and a fresh citrus vinaigrette. Let’s start by talking about the dressing that coats this salad! It’s tangy, citrus-y, and full of flavor. PLUS it’s healthy. I love eating salads, but sometimes the dressing makes the salad pretty unhealthy and high calorie. Not that I’m counting my calories (I would not want to know the calories in a slice of Thin Mint Cheesecake, or an entire skillet of Cinnamon Roll Cake — the husband and I have eaten way too many of those!) But I do like to know my salad isn’t as many calories as, say, a fried chicken. Which, funny fact, at a restaurant I used to work at, there is a fried chicken on the menu that has as many calories as one of the salads. Not joking. Crazzzzzy. This dressing is the perfect amount of sweetness with tang! Another main ingredient in the salad is the chicken. The recipe calls for grilled chicken. And let me tell you; this recipe for grilled chicken is the absolute BEST! However, if you don’t have a grill, no problem. You can cook it over your stovetop in a large saucepan. I like to season the chicken with some salt and pepper and chicken seasoning (on both sides) if you cook it over the stovetop. It’s also going to be best if you have a chance to marinade it before cooking. And another alternative is to chop up some leftover chicken from a rotisserie chicken. 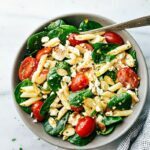 Other than the chicken and dressing, the remaining ingredients are pretty standard — cherry tomatoes, spinach, feta cheese, and toasted slivered almonds. Enjoy! Cook the pasta according to package direction. Drain and then rinse with cold water. Place the cooled pasta in a large bowl. Add in the spinach and the halved cherry tomatoes. Briefly warm up and then coarsely chop the leftover grilled chicken. Add to salad and toss to combine. Lightly toast the almonds over a skillet on medium heat until fragrant. Sprinkle the almonds and feta cheese over the salad. For the dressing: combine all of the ingredients together except for the oil in a blender. Blend until all ingredients are well incorporated. Slowly add in the oil in a steady stream and pulse until combined. Toss the salad with the dressing (to taste; you may not want/need all of it) and enjoy. ONLY toss what you plan on eating as the dressing makes the spinach "soggy" for leftovers. 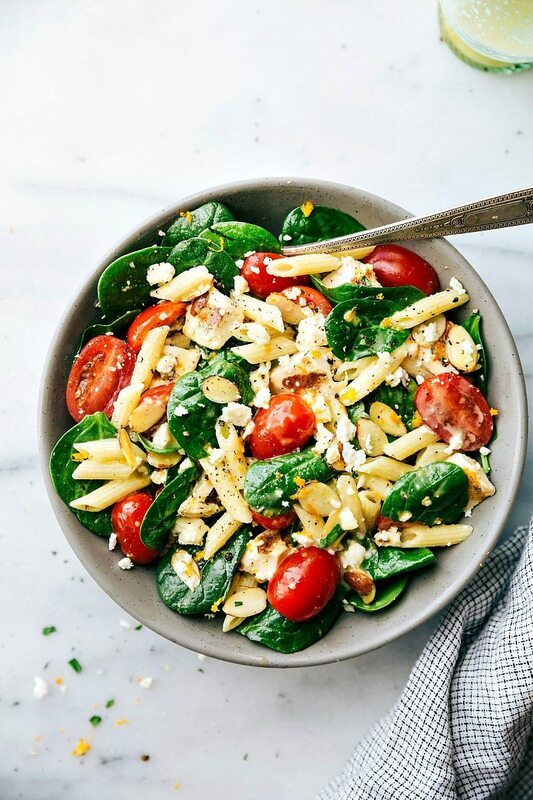 Beautiful pics, love everything about this salad/pasta dish. I love how you present salads/pasta dishes. Beautiful! I’m all about salad dressing, so appreciate you talking about it first! It’s such a crucial part and some people tend to overlook it. I don’t even buy salad dressing anymore. Anyways, I feel like I can taste this just by looking at it, so great! Pinned for later. Thank you, Chelsea! This is a beautiful salad! 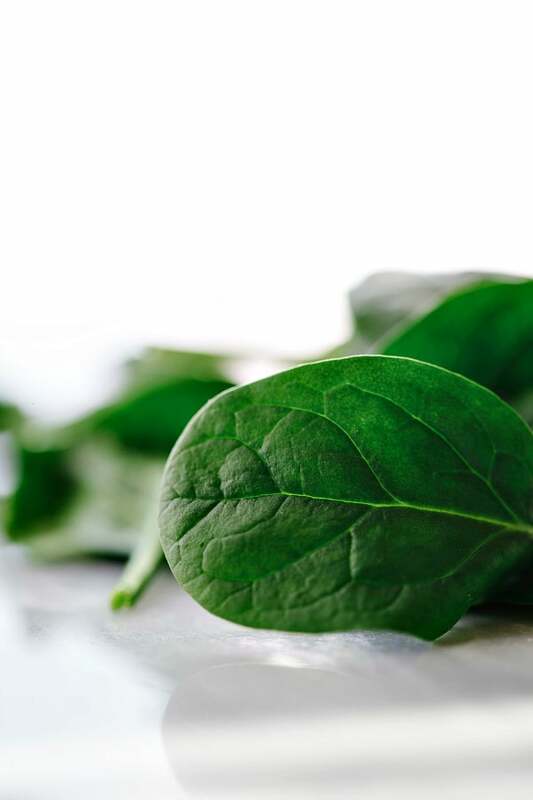 I love spinach salads. 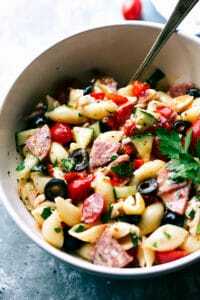 I love simple pasta salads such as this! I am such a sucker to spinach, cherry tomatoes and feta. Simpler the better is the way to go! Oh how pretty! Whenever you can get me to crave a salad you’re good. You’re really good! YUM! 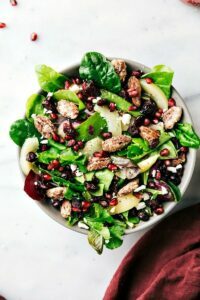 this salad looks like exactly what I need for spring – bright, colorful, and healthy! I love the pop of red from the grape tomatoes on this salad Chelsea!! The dressing sounds fabulous!! This pasta looks so fresh and colorful—exactly the kind of food I’m craving these days. Gorgeous photos! pinned. That dressing sounds amazing! 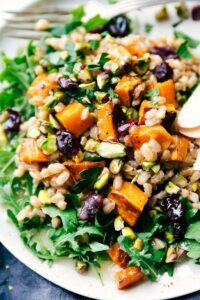 You make the best salads – I love all the flavors in here! Pinning! Hope you have having a fab weekend, Chelsea! Thanks Cate! And thanks for the pin! I hope you have a great weekend too!